Morningside is a neighborhood of homes in the northeast quadrant of Atlanta. Its borders are roughly defined by Cheshire Bridge Road and the Seaboard Railroad line on the north; the intersection of Briarcliff and Johnson Roads on the northeast; the Cumberland/East Rock Springs Road intersection on the east; Amsterdam Avenue and Lanier Blvd on the south and southeast; and Monroe Drive and Piedmont Road on the west. These boundaries include Lenox Park, which is joined at the hip with Morningside. The area on either side of Johnson Road between East Rock Springs Road and where Briarcliff Road merges was originally Johnson Estates, but it is part of Morningside now. You may see the name in real estate ads because the houses are generally bigger and grander than those south of East Rock Springs road. It has a strong civic association staffed entirely by neighborhood volunteers. This group, officially named the Morningside-Lenox Park Association, was formed several decades ago to fight a highway that was planned to rip right through the middle of the neighborhood. The neighborhood group fought the Highway Department and won, and this commitment to neighborhood quality-of-life has continued to this day. Plus, there are over a dozen neighborhood parks in area including two nature preserves. Schools including Morningside Elementary, Springdale Park Elementary, Inman Middle School and Grady High School. Searching Morningside homes for sale in Atlanta? 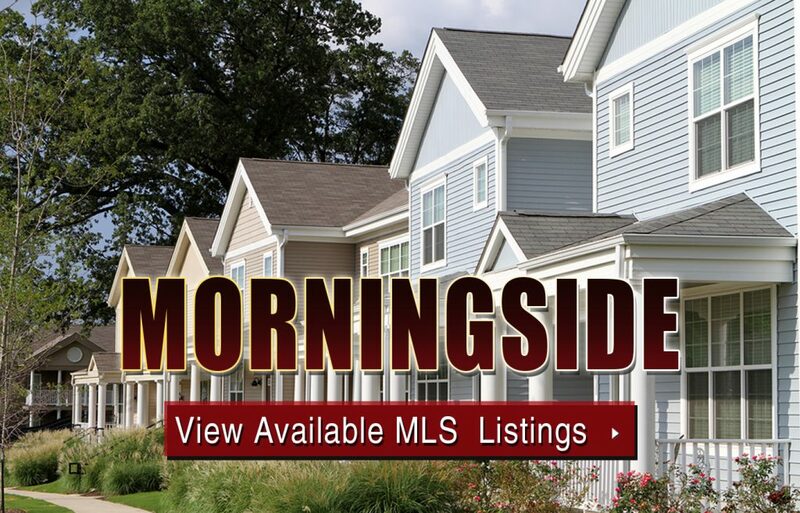 Check out what’s currently available in some of Morningside’s top neighborhoods and communities. What makes living in Morningside special? Before searching Morningside homes for sale, read more about the neighborhood below! The Morningside Tour of Homes has differentiated itself from other home tours by having local chefs demonstrate their prowess in the designer kitchens of the wonderful houses on the tour. This has proved to be a great success! And it also proved that those kitchens are NOT just for show: they really do work! Of course, they will continue to do a great job of showcasing take-out dinners. (Okay, we’re just envious!) But remember some of the fine restaurants that have sponsored the tour in the past: Agnes and Muriel’s, ONE midtown kitchen, Woodfire Grill, and Murphy’s. Much of the charm of Morningside is a direct result of this decades-long work of neighborhood residents to keep Morningside livable and attractive. Only one shopping area exists wholly within the Morningside neighborhood, but it is a great one! Highland Walk is at the intersection of Lanier, University, and Highland and well worth the trip. Great restaurants like Pomodoro share space with moderately-priced eateries like Doc Chey’s Noodle House and Caramba Mexican Restaurant. Gift shops, antiques, art galleries and more delight the eye as well. Last but not least is one of Atlanta’s premier bakeries and gourmet shops: Alon’s. On Saturday mornings (7:30 – 11:30 a.m.) year-round, the Morningside Organic Farmers Market appears like Brigadoon in the parking lot across from Alon’s. Be sure not to miss this! Can’t find what you’re looking for in Atlanta’s Morningside neighborhood? Start browsing other Atlanta real estate for sale or give the Zac Team a call at (404) 564-7272 for help with your new home or condo search today!